Create that Awe Factor with our plate sized Gift Worthy Cookie! Choose the cookie flavor, occasion and include your personal message. 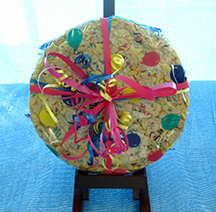 Gift Worthy Cookie are wrapped in decorative cello and matching ribbon. Our Gift Worthy Cookie is shaped by hand and is available in two sizes. The Baby Big is 10″ round and 1 1/4 lb. The Big Mama is 14″ round and 2 1/2 lb. Don’t see the cookie flavors you’re looking for? Customize It!